Not yet officially rated by the ESRB, promotional copy on the game's official page bills EA Sports' next boxer as the publisher's first ever M-rated game. "As the first-ever ‘M' rated EA Sports title, Fight Night Champion showcases the truest graphical representation of the sport, lifestyle, and culture of boxing with authentic and dynamic blood, realistic body damage and deformation, and mature content throughout," says EA Sports. "Experience the violence and brutality that is true to the trade." 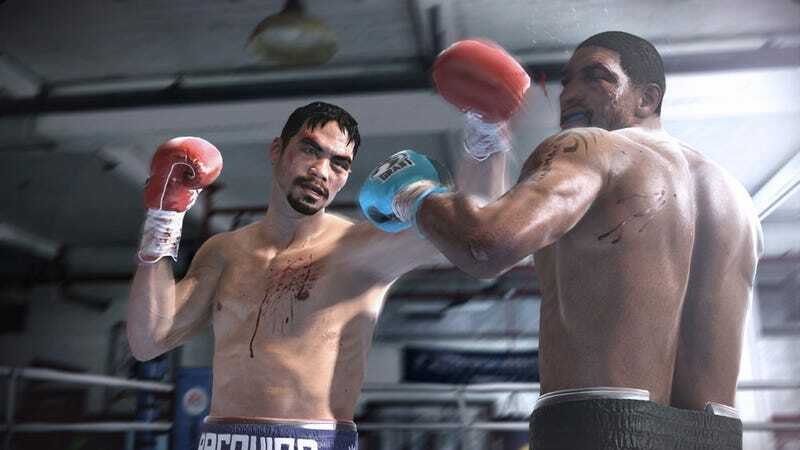 Scuttlebutt and forum comments over the past few weeks had Fight Night Champion, the fifth installment of the boxing simulation, as an M-rated title, and gory screenshots certainly seemed to be the reason why. "Mature content throughout," indicates it may go deeper than that. M-rated sports games are not unprecedented - Blitz: The League and its sequel certainly comes to mind. None, however, have the kind of stature of the Fight Night brand, nor have they been as highly acclaimed. EA Sports assuredly knows its the median age of its user base and took it into account before acting, but this is a bold step nonetheless.